Alexandria Squirrel Removal Services & Squirrel Control! Squirrel Removal is a very common problem that Alexandria Wildlife Pros are very good at solving. Squirrels are used to being around humans; therefore the presence of humans does not alter or bother their activities. Squirrels can be found in Alexandria parks, running across power lines, and running down sidewalks. One place that we do not want to see a squirrel is on top of your home. Squirrels are the second most destructive animal in the animal kingdom second only to a raccoon. 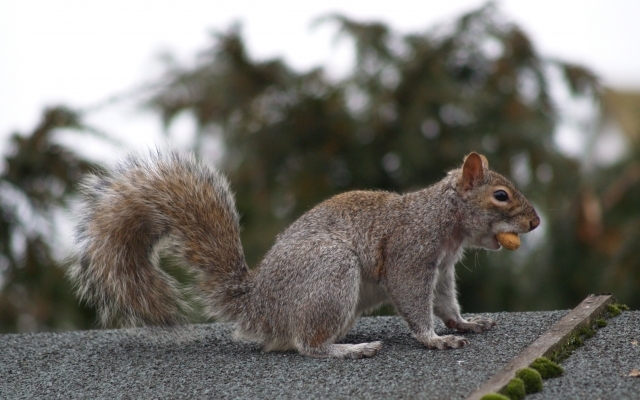 Squirrels do over $2 billion of damage a year to homes and businesses. Squirrels and other rodents are responsible for one half of unexplained fires in the United States every year this is because of the squirrels need to chew constantly. They will chew your power wires, phone lines, TV cables, in any other substance in which they can satisfy their urge to gnaw. Squirrels will also damage your homes attic insulation by defecating and urinating on it. They will also trample and smash it therefore ruining the R-value of the insulation. An insulations R-value is the ability of the insulation to effectively maintain thermal resistance. When a squirrel smashes or flattens the insulation it decreases the R-Value of the insulation. Essentially the flattening of the insulation provides no thermal value to your homes thermal resistance. If you feel you have a squirrel in your attic or in your home please do not hesitate to call Alexandria Wildlife Pros at 703-656-2093 immediately for a no obligation in home inspection. Squirrels should never be allowed to remain in your home call today! Squirrels communicate with each other through various vocalizations and scent marking. Squirrels use their tails as a signaling device to other squirrels as a way to alert danger. They run in erratic paths to deceive potential predators.